Q: Will raising the inlet pipe to the top of the tank provide an adequate mixing solution? There are many people who believe that raising the inlet pipe, and letting water cascade into the tank from the top, will provide adequate tank mixing. However, the water coming into the tank is often colder (and heavier) than the water already inside the tank. This cold water falls straight to the bottom of the tank without much mixing with the warmer water in the tank. It really doesn’t matter where you configure the inlet pipe – unless you have continuous cycling of the water from that top inlet down to the bottom, you will not achieve mixing. Q: Is there a significant drop in mixing efficiency with large diameter tanks? It may seem counterintuitive, but the PAX Water Mixer’s efficiency doesn’t go down in large diameter tanks – it goes up! What limits the efficiency of a mixer is the water’s resistance against the outer walls of the tank. As the water leaves the mixer and circulates to the outer edges of the tank (rubbing against the walls and floor), it slows the water down and provides resistance. The larger the diameter of your tank, the less resistance the mixer has and the more free volume there is to circulate. Other mixing technologies that use flat jets or draft tubes claim high pump rates, typically do not show this favorable scaling with tank diameter. While the mixer’s efficiency goes up in a large diameter tank, the average velocity of the water in the tank might go down. Because the mixer operates at the same power regardless of tank size, the velocity of a mixer in a 5 MG tank will be lower than its velocity in a ½ MG tank. 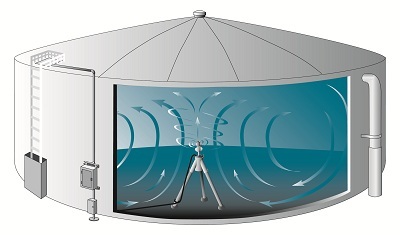 Even though the velocity might be smaller in larger tank, the total volume of water moving is larger. It is similar to comparing a small river that travels fast to a large deep river seems to travel much slower but more water goes through it. Q: Can you mix a tank with supporting columns? Typically, you will find a lot of supporting columns in underground tanks or very large reservoirs. While these columns may look numerous (and may seem to be a substantial impediment to mixing) their surface area is relatively small compared to the surface area of the basin of the tank. Thus, the columns aren’t very taxing on the momentum of the mixer.